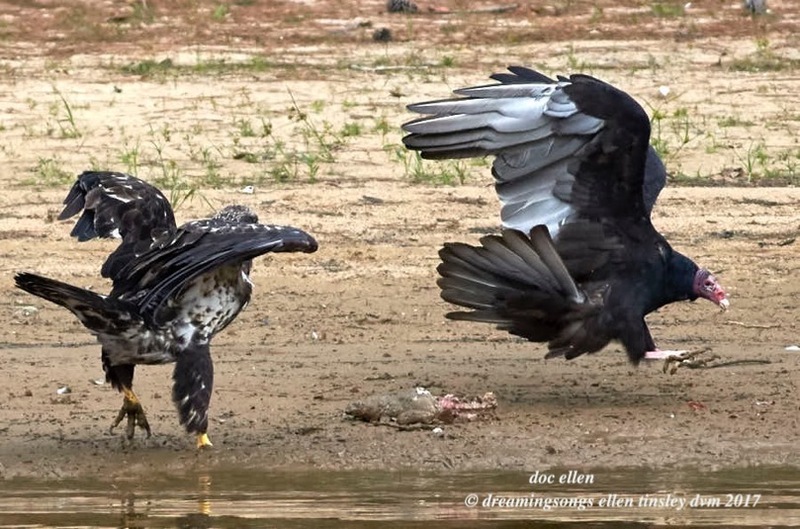 The 2-year-old bald eagle on the left had been eating on the dead fish. Strolled down to get a drink at the water’s edge. The turkey vulture tried to steal a bite of the fish …..
Posted in birds, Eagles of Jordan Lake, Jordan Lake, Jordan Lake State Park, photography, raptors, vultures, wild birds and tagged as 2 year-old bald eagle, American bald eagle, bald eagle, bald eagles of Jordan Lake, eagle, eagles of Jordan Lake, immature bald eagle, immature eagle, Jordan Lake, Jordan Lake State Park, raptor, turkey vulture.